Former presidential candidate Mitt Romney attended a regional conference for young single adults in The Church of Jesus Christ of Latter-day Saints. The conference was held at Arizona State University on Jan. 11 and featured other prominent Latter-day Saints, including Thurl Bailey and Vai Sikahema. Romney spoke about obstacles and how success can only come from loving God and his children. But what many in attendance are sure to remember is what happened later that night during a concert put on by Mormon artist Alex Boye. 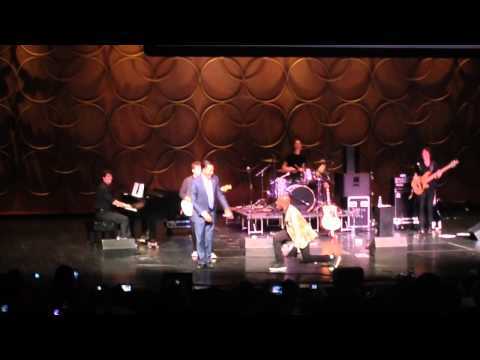 As shown in a YouTube video, at one point in the concert Romney joined Boye on stage, and the singer began to instruct Romney on a dance move. According to Boye, he was teaching Romney the "Gangnam Dance." Although it was only for a few seconds, the audience erupted with enthusiasm for the politician's willingness to participate and many caught the moment on video. Conference attendees also shared their reactions on Twitter. Using the hashtag #azysaconference, many other young single adults shared their experience at the conference on Twitter and Instagram.